Whenever I hear terrorists referred to in the media as "militants," it is a painful reminder that we have degenerated to the point where we no longer even have the courage to talk straight. Does anybody seriously believe that "hate speech" prohibitions will be applied to Muslims demonizing Jews, to blacks demonizing whites, or to women demonizing men? Few things are more scary than the number of people who rely on talking points, instead of weighing serious issues in a serious way. The same people who think it was wonderful that the Warren Court forbad government to assign children to schools on the basis of race think it is terrible that the current Supreme Court has recently stopped local governments from assigning children to schools on the basis of race. In politics, there are few skills more richly rewarded than the ability to misstate issues in a way that will sound plausible and attractive. "Nations are like men in that they prefer a fuss made in their behalf to real services rendered." Although de Tocqueville said this back in the 19th century, it may help explain why the black vote today is so overwhelmingly for the Democrats, when Democrats have done so little good for blacks and so much harm. In contrast with today's senators who try to get every Supreme Court nominee to pledge allegiance to Roe v. Wade, when Abraham Lincoln was considering nominees to that court, he said, "we cannot ask a man what he will do, and if we should, and he should answer us, we should despise him for it." If the Democrats' presidential and vice-presidential candidates next year are Hillary Clinton and Barack Obama, most of the mainstream media will just gush at the image and the rhetoric of a woman and a minority -- and specific issues and track records will fade into the background. A month doesn't go by without several offers to lend me money arriving in the mail. Where were these people when I was broke? Many people who have never held a firearm in their hands are nevertheless convinced that the police fired too many shots in a confrontation with a criminal. Many people who have never run one business for one day are nevertheless confident that they know corporate CEOs are not worth as much as they are paid. 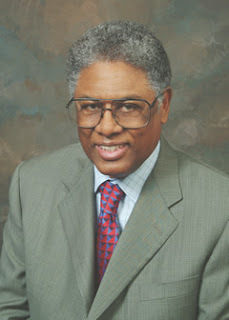 Thomas Sowell is a senior fellow at the Hoover Institute and author of Basic Economics: A Citizen's Guide to the Economy.